Nice color in the clouds and good resolution. I like the vantage point getting up above the landscape. Very interesting large scale photo. The colors are very good. I am very happy with your focus, contrast and composition. Really awesome range of colors captured. The details in the clouds are fine and crisp. I think some of the bottom could be cropped out as they distract from the clouds a little. Overall, well done. I like how you were able to capture the amazing colors of the sunset. Taking the photo at elevation was a great technique. Great job! 1. The image is artistically pleasing and the pinks and bluesl of the clouds are very pretty. 2. The flow is clearly demonstrated. 3. The photographic technique is very nice with good details in the shadows. Wow, this image just looks very focused and dramatic. The vibrant colors as well as the shape and size of the cloud make this image that much better. Great Job! This is an incredible image! The cloud in the foreground is showing where the sun has already set behind the mountains, and then the cumulus cloud over the plains is just fascinating! You have captured a huge range of colors, from the oranges and golds in the cumulus cloud, to the turquoise and blue in the sky. Even the textures vary in the cloud from light and fluffy to smooth at the top. Great job! Nice yellows and oranges in the cumulus cloud which contrasts nicely with the dark cloud in front and the almost blue green sky above. 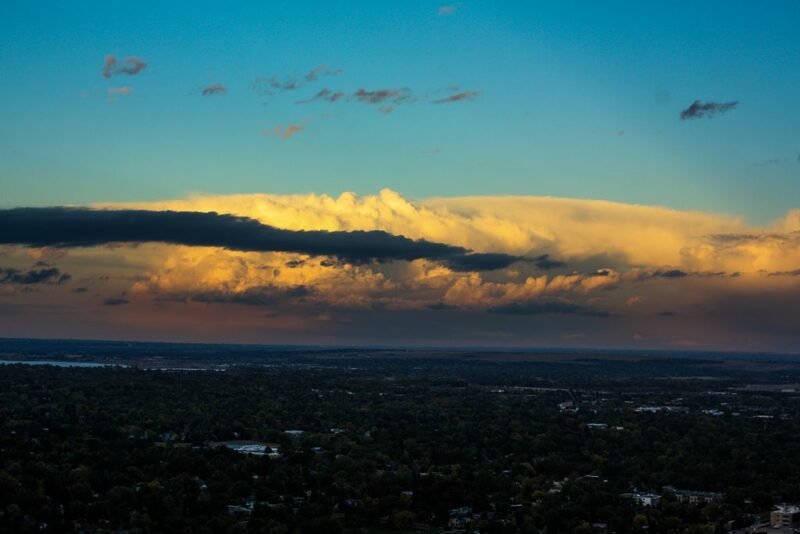 A great example of the massive cumulonimbus clouds which develop in the evenings in Colorado. FYI there is a dust spot in the upper right that would be pretty easy to remove with a little clone stamp. The crisp focus, and the different colors make this image pop. My favorite is the blues captured in the sky above the clouds. Beautiful! I love the color and contrast! The light sky over the dark ground is great ! Lovely colors, spectacular detail in the center of the cloud formation. I like how you zoomed out to capture the whole system but it makes those details on the inside a little hard to see. Art: I really like the color contrast of the bright highlights of color on the clouds and the dark background of the city. Photographic technique: The focus of the clouds is great. This is a beautiful image! The colors are just stunning. The contrast of the yellow clouds and light blue sky is gorgeous. I love the detail in the clouds and the dark one stabbing through, all just beautiful!! Cloud image quality is great as well! Very lovely image. I really like the gold tint on cloud front moving in/away?. I also like the red ting towards the bottom. I like the dark “finger” cloud in front of the huge cloud. I would try cropping out the bottom and top a little as it seems to take up a little too much space in my opinion. really nice contrast in the photo. I like how the clouds are just sitting in one wall over the front range instead of just over the mountains. provides a different view of whats happening around boulder. This is a super cool cloud wall and the darker cloud in the front adds an interesting layer to the photo. You captured some exceptional color in the clouds. Great colors! I like the cloud that does not have any sun on it in the foreground that gives some depth to the clouds that are illuminated. The horizon is also nice and sharp with is a change from all the mountain foregrounds we have been seeing. Dang! Nice coloring here, contrast is nice, the detail of the cloud is really nice. The sunset really helps to highlight the features of this cloud. Nice! Love the variety of color in the image! Awesome location and time to snap this image. Really like the colors and view. I really enjoy the contrast between the blues, yellows and oranges. I feel like the city is a bit distracting from these beautiful clouds, maybe consider cropping them out of the image. The dark clouds slashing in front of the large orange one adds a nice effect. I like all the different colors in the image. Zooming in and cropping out the bottom would help make the clouds pop. – The orange/yellow hues are really distinct in this photo. – Photo is very clear and focused. – Only suggestion I have would be to crop out some of the ‘negative’ space below to have more focus on the clouds.